"Not many people know what they'd die for…" Universal has aired a first look at the gnarly action movie Skyscraper as a Super Bowl TV spot, with a full trailer coming soon. 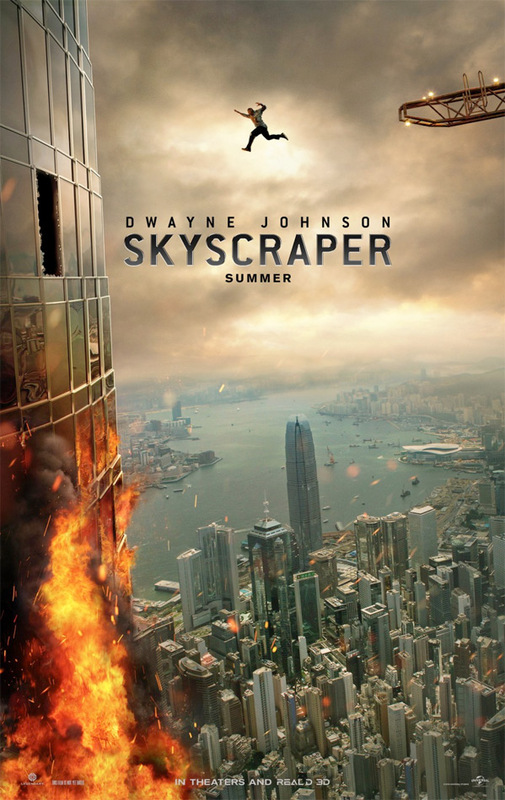 Skyscraper stars Dwayne Johnson as former FBI Hostage Rescue Team leader and U.S. war veteran Will Sawyer, who now assesses security for skyscrapers. When a fire breaks out on a big tower in China, he's framed for it, and finds himself on the run while trying to save his family trapped inside the skyscraper. That's a crazy plot, totally absurd but obviously designed as pure summer movie entertainment. The cast includes Pablo Schreiber, Neve Campbell, Roland Møller, Kevin Rankin, Byron Mann, Chin Han, Paul McGillion, and Adrian Holmes. As much as I thought this might be awful, it doesn't look so bad. Full trailer can be seen here. Check this out. You can now watch the first full-length trailer for Skyscraper here, to see more footage from this movie.